The Bengal Cat is a relatively new hybrid variety of cats creating by cross breeding a domestic cat with and Asian Leopard Cat. Their name is derived from the Latin name of its wild ancestor- Felis Bangalensis, and is not related to the Bengal Tiger. It was created to combine the appearance of the wild feline animals with the temperament of the domestic cat. There are four different types of Bengal Cats. They can have one of the two separate patterns – spotted or marbled on one of the two different types of coats – brown or white. Bengal Cats can be both short haired or long haired. Bengals cats typically have ‘wild markings’, namely spots and rosettes as well as stripes. The spots and rosettes appear on the back and stripes elsewhere, including the forelegs. 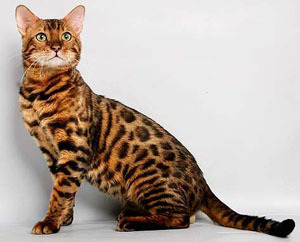 The Bengal cat also has ‘mascara’, i.e. dark/black horizontal stripes alongside the eyes. The Bengal Cat comes in several colors like brown, mink, sepia, silver and seal lynx point. The Bengal Cat is large and sleek, has a muscular body and a thick tail. Its hind quarters are slightly higher than its shoulders. It is the only cat that has gold or pearl dusting on it pelt which is satiny or silky smooth. The Bengal Cat is considered to be a self-assured cat, both affectionate and playful. They love to play in water. They can also coo and chirp and love to jump and somersault. No specific caring is required for the Bengal cat. However, if you are considering getting a Bengal Cat as a pet, ensure that it is at least four generations removed from the Leopard Cat. This will ensure its domestic temperament. Looking to acquire a Bengal cat as a house pet. Any suggestions of sources? We sell bengal cats! I would be happy to let you have one of our kittens! We actually have a few available right now! I would love to Have a Bengal Cat. How much would you be selling for? Do u still have Bengal cat kittens ? Do you still sell bengal cats? i am also looking to buy one! I have allergies to cats are Bengal Short haird fine? or what would u recommend? Try to find Cornish Rex, Sphynx or Devon Rex Cats. They are almost haven’t fur. i think that if you have alergies to cats with fur maybe you should either go with a different animal or maybe get a sphynx cat they dont have any fur for you to get more alergies. I read on another site that it is illegal to sell bengal cats, but you can purchase them. What does this mean? And how could I find a legitimate bengal cat breeder if I wanted one? Does anyone have an suggestions on places to aquire a bengal cat, most likely around St Louis? My wife may be able to get you one for free. We have one of two sisters and the other one needed a home a short time ago because the owners were looking to move and couldn’t take her and I haven’t heard if she ever found a new home yet. My Bengal (her name is Cassius)and her sister will be going on three years old this year. They are both RUNTS. They are very small and will not grow any bigger. They are very rare to find as runts. About 3-4 pounds or like a large squirrel as I like to say. Very vocal and very playful. When people see my little girl they think she’s a kitten until I tell them that’s as big is she’ll ever be. It’s great. My Cassy loves to fetch, lick you like crazy if you let her, and very smart with a very unique personality. Very clean cat with the smoothest coat I’ve ever felt (like silk). I’m assuming her sister is the same way. I can find out if you like. I don’t know where you live, but I’m in Western Pennsylvania. I would like to know if you have had anymore contact with this owner??? I have been looking for years and watched a kitten program today about the Bengal. Awsome Feline. Could you let me know. are bengal cats good pet? i am very interested are Bengal cats friendly? They are the cutest things out there..I would love to know more about these. These cats are sooo cute! I am very flattered that my baby boy Sir Master King Zuess is your background picture. :) he is a Seal Spotted Lynx Point Bengal. Just shy of 10 months old. Incase anyone was wondering yes they are slow growers. He will not be true size unt…il he is 18 – 24 months of age. He has a dog personality, loves water, walks on a leash, does trick/ stay/ roll over/ highfive. He is trully my best lil friend. It is an honor for his charming good looks can be shared with other cat lovers. A year ago in Nov. we decided it was time to replace our dear departed cat, Shelly. We went to the Animal Shelter and let a couple of older kittens pick us out. The shelter let us play with them for awhile and suddenly we were being kissed by the sweetest, prettiest kitten. She has all the trates of a Bengal. She doesn’t meow, but will chirrup once in a while. She has stripes, spots, squares and all kinds of markings. She has the Cleopatra eye makeup and is very playful and sweet. Our vet says she’s just a tabby, but I think he’s wrong. Lily isn’t very big so I’m guessing we lucked out and got the runt of a litter from some dealer. My father had a Bengal cat which he ended up giving away. They are fierce hunters and will easily munch up small animalls like rabbits, squirrels, raccoons, possums etc. They need pretty constant attention otherwise they become antisocial and aggressive and will attack humans. I had a bengal for almost 17 years. She was a runt but could chase down a dog when she wanted to. She was a one person cat, She would greet visitors with kisses and talk, but only I could carry her or hold her. She loved her bathes and boxes to hide in. They are very courious cats. Bengals made wonderful pets, but I never left her alone with small children as her claws were hooked and could scratch even in play. My beautiful baby died peacfully in her sleep. I sure miss her. We have had a Bengal for almost 10 years now from the SPCA. Her records show the couple who bought her originally for $300 kept her for one day before bringing her to the SPCA. Like many cats you must socializer the Bengal. She is an indoor-outdoor cat and will go after many small animal – once she dragged in a huge squirrel. She loves to be petted and sleeps at the end of our bed. She comes when called but is a picky eater… we feed her a combination of wet and dry food (separately). She is truly a dear cat. We have 3 other cats – a dominant Tabby or at least he thinks he is top cat; a deaf white long-hair Angora who is an over-weight love. And last but not least – a Capuchin Siamese – or at least we think that is what he is. They all get along pretty well – the main fights are between the Bengal and the Tabby… but they are mainly turf wars and don’t draw blood or remove fur. We have had dozens of cats over the years and I have never met a cat I didn’t like! I live in Port Arthur, TX and have been looking for a Bengal kitten forever. Does anyone know any breeders in Texas? Houston is only 80 miles from me.